Retiring to Arizona....since 2004 with no regrets. 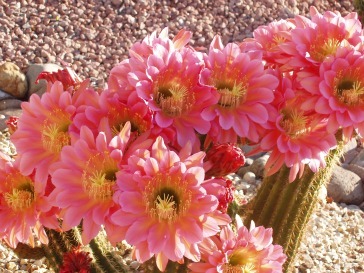 Didn't know that cacti actually bloom once in a while? We first considered retiring in Arizona in 2002, visiting first in our RV ... two years later we were permanent Arizona residents... we have never regretted our decision to make Arizona our retirement home. Before we visited, we had the impression that Arizona was all desert and most of the residents were on oxygen. Wrong on both parts, two thirds of the state is forest, they have two ski areas...and the residents are for the most part very active, enjoying the 300+ days of sunshine. Go figure, Arizona has some of the lushest golf courses in America... in the middle of the desert... thank you Colorado River. We chose Sun City Grand, a Del Webb master-planned retirement community in Surprise, Arizona a suburb of Phoenix. We always enjoyed visiting model home parks in our RV travels , especially the Del Webb parks...we were able to buy a new home for $85 a foot finished. It's not that cheap now, but relative to other places in the country very reasonable for new construction. With four very good golf courses huge fitness centers, well equipped craft facilities...we feel we got a lot of bang for our housing dollar...we still feel that way. Now years later it has recovered value in spades. Although most of the population is concentrated in the desert areas of Phoenix and Tucson... Arizona has a very diverse topography, that is a surprise (no pun intended) to most people who envision nothing but desert. Lots of forest land, the Grand Canyon, four seasons if you want them. In Flagstaff for instance, at 7000 feet, you get all the snow you want in the wintertime. The eastern part of the state is filled with forests and mountain lakes. Where we live we get a whopping 3 inches of rain per year...the airport gets 12...25 miles go figure. Our community does not allow grass lawns, crushed rock in desert landscaping is the norm, so you don't have to listen to lawnmowers early on Saturday morning. We found that retiring to Arizona was a good decision in 2004, and still a good decision now, and there is plenty of room for you if you would decide to come and enjoy the sunshine...come on down.